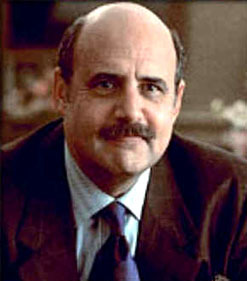 Jeffrey Tambor is a character actor with a comic touch, recognized by his shiny head, portly build, and booming voice. In his two most famous roles, he was the Ed McMahon-esque sidekick on The Larry Sanders Show and the unethical patriarch of the Bluth family on Arrested Development. He studied acting and taught for years, and worked on stage with such actors as George C. Scott, Meryl Streep, Sam Waterston, and Judith Light. He was 33, with 15 years experience as a professional actor, when he first appeared on television, performing an autopsy on an episode of Kojak. He appeared in four episodes of Three's Company in different roles, and then played the comic next-door neighbor and foil for Norman Fell and Audra Lindley in their spin-off, The Ropers. He was a cross-dressing attorney (and later judge) on Hill Street Blues. He played the Dabney Coleman role in the TV series of 9 to 5, until he was replaced by Peter Bonerz. He was the news producer on Max Headroom, played stuffy sorts on The Golden Girls and L.A. Law,, did voice work on Jonny Quest, played the imprisoned patriarch on Arrested Development, and co-starred in the short-lived sitcom Twenty Good Years with John Lithgow. He has also acted in films, such as the comedies Mr. Mom, Three O'Clock High, City Slickers, There's Something About Mary, and Funky Monkey. He voiced the Mayor of Whoville in How the Grinch Stole Christmas, and King Neptune in The SpongeBob Squarepants Movie.